…and she disappeared for almost a month. My last post was dated the 29th of April – how time flies! Hopefully I have a few readers still checking back Don’t worry though, I definitely didn’t forget about the blog. I worried about and often itched to write a blog post, but the past few weeks have been beyond crazy: training for races, deadlines – you name it, I did it! Yet the lack of posts doesn’t mean there was a lack of cooking or baking. 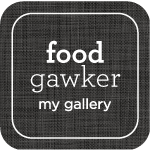 I’ve got heaps of great recipes lined up and ready to go for all of you, including some savory which hasn’t been showing much on Crunch and Chew. Let’s talk pancakes, though. Coconut pancakes. Hot coconut pancakes with fresh strawberries and creamy strawberry-banana soft serve. Would you believe that this is healthy, too? The pancakes get their coconuttiness from coconut butter in the actual batter, used to replace the usual oil or margarine in vegan pancakes. Simple but delicious soft serve ties the dish together – and who doesn’t like ice cream for breakfast? Preheat oven to a very low setting. In a large bowl mix together flour, baking powder, salt, sugar and lemon zest. In a smaller bowl mix together the milk, coconut butter and lemon juice. Be quick as the coconut butter can solidify quickly in the milk! Make a ‘well’ in the dry ingredients and pour in the coconut-milk mixture. Mix until just combined. Cook batter like normal pancakes (pan greased with a little oil or melted vegan butter). While cooking the others, keep warm on a tray in your preheated oven. Make the soft serve by blending all soft serve ingredients together. 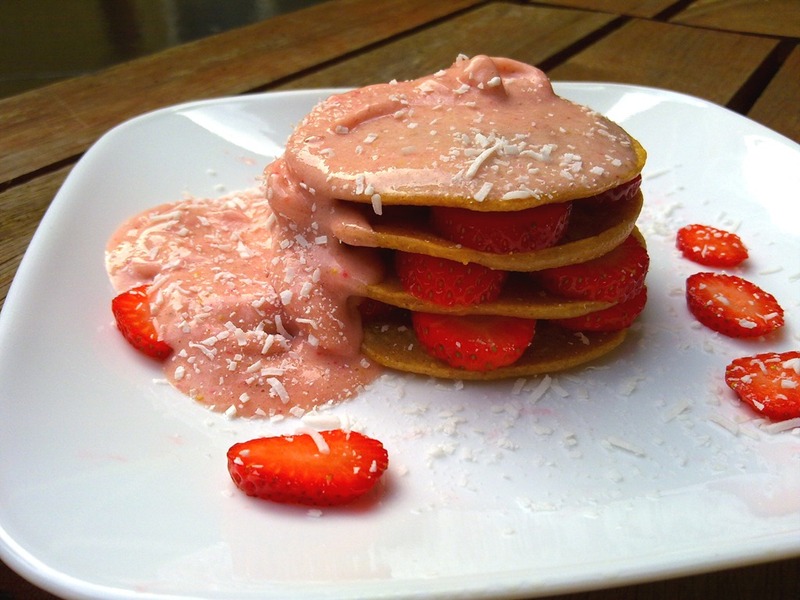 To serve, stack the pancakes and strawberry rounds, then top with soft serve and sprinkle with shredded coconut. Serves one hungry person! Look at the fresh strawbs and the melting soft serve! I need to make these again. You just made my day. I am on a 1 week “no sugar/ sweetener added” challenge right now- and these totally fit the bill! I am pretty sure they will be in my kitchen in the morning. 🙂 Thanks! That sounds great! Hope you liked them. Wow, these look amazing! 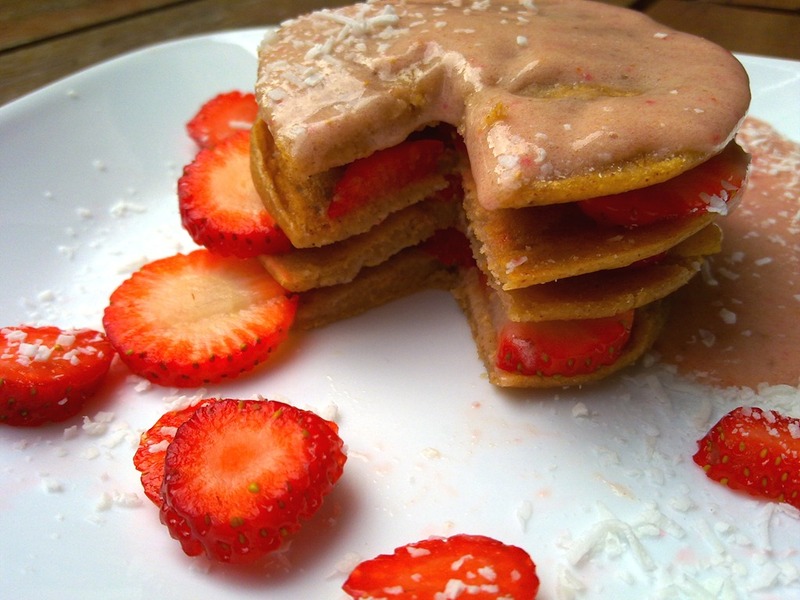 Especially with using coconut butter in the pancake recipe…love! hey Pearl! i’m drooling over those pancakes! mmmmmmmm!!! Wow. These look so elaborate! I love the idea! I owe it all to Angela!